Musical Theatre News: Sweeney Todd Broadway Bound? 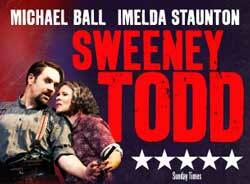 In the last two interviews I have heard with Sweeney Todd’s Michael Ball and Imelda Staunton they mention Stephen Sondheim’s involvement, excitement and delight in both in the West End version which is due to open on 20th March and in the cast highlights CD which is due to be released on 2nd April. Certainly the excerpt they have just played on Graham Norton of Sweeney and Mrs Lovett singing "Priest" makes me want to go out a get a copy as soon as it's available. Imelda Staunton stole the show for me and in the cast recording her acting abilities, vocal skills and comedy timing are showcased at their very best. They have also said that Sondheim is very keen for this updated version of his show (it is no longer kitsch Victoriania and now set in industrial London East End circa 1930) to transfer to Broadway. 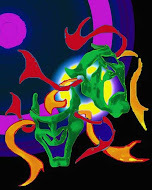 It has a limited run at the Adelphi and is currently due to close on Saturday 22nd September 2012. Michael Ball looks very different as Sweeney as he is wearing a straightened hairpiece at the front and has grown a beard and lost weight (to avoid the obvious headline "guess who ate all the pies?") . He said "it's been great to leave the West End as an overweight mother of one (Edna Turnblad in Hairspray) and come back as serial killer". He has said he feels Sweeney Todd is Sondheim's greatest piece, and having seen it at Chichester and at previews I must say I agree with him.